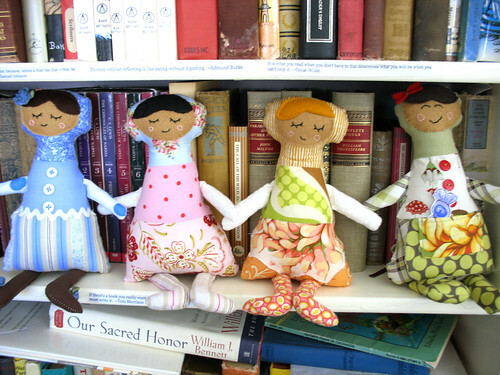 Too soon for Christmas decorations - Stop staring and start sewing! But not too soon for this. 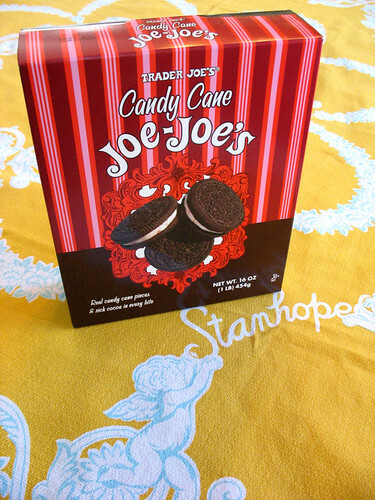 Trader Joe's makes these yummy little fake oreos. They taste just like oreos but they are good for you (I know, just play along here). Lo and behold, I just found out they have Christmas Joe-Joe's! My hunny brought these home and usually I'm pretty irked when he deviates from the list but I will overlook it this time. Aren't they just the cutest??! I think they are actually sweet little "book guards" and if you reach for one of her precious, dewey decimel ordered (except for those few underneath) books, they will turn into little demons (kind of like Jack-Jack) and bite your hand off. You can find a link to the tutorial for these right here. She keeps asking who she should give them too. I just smile sweetly and bat my eyelashes (oh please, oh please, pick me).